Having looked at the extent of the ‘lake country’ in Ransome’s books, I thought it would be interesting to compare it with the real world, i.e. the places we can actually visit on foot, on bike, by train, boat or car, rather than in our imagination. The first map covers the full extent of the Lake District National Park. The background map is OS 1:250,000, under the OS OpenData Licence. All additions are © Jon Sparks. Don’t worry too much about the detail yet; just notice how nearly all the purple blobs and dots are concentrated into a fairly small area of the southern Lake District. We’ll deal with the odd outliers later. Now let’s look more closely at the core area. 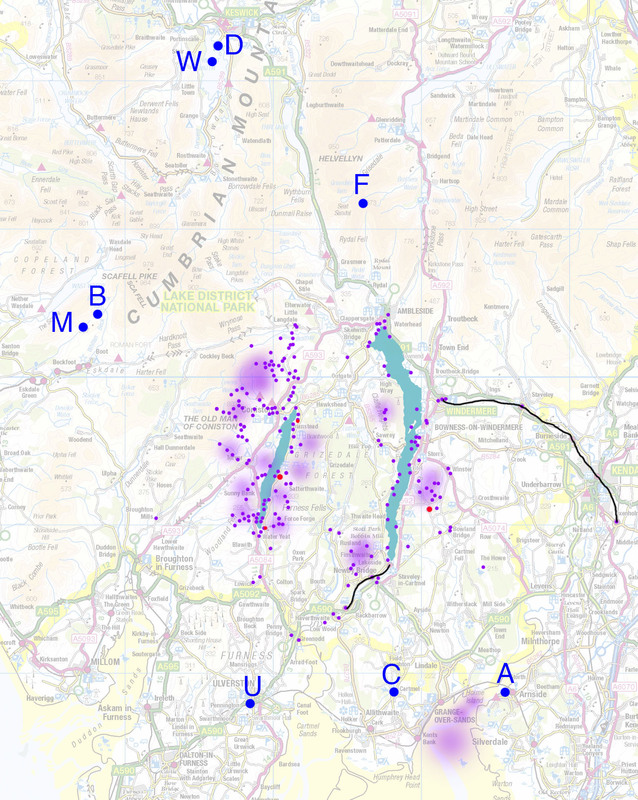 A little explanation: the purple dots are places mentioned in Exploring Arthur Ransome’s Lake District. Diffuse blobs are areas, such as Morecambe Bay or Claife Heights, rather than ‘point’ locations. Purple lines are walks in the book and black ones are railways mentioned. What I hope stands out here is that there is rather a large ‘void’ in the middle of the map. Neither Hawkshead (a very popular tourist village) nor Esthwaite Water get a mention. Ransome must have known them, and I’m sure he fished on Esthwaite, but nothing that I’m aware of ties them to any location in the stories. Actually we could take out even more of the locations that I’ve marked in the middle. Rusland Heights, beside the southern end of Windermere, is only marked because I put in a bonus walk there, not because of any specific tie to the stories but for its atmosphere. The same could be said of Claife Heights, further up the west side of Windermere. What I hope is really obvious is how most of the locations around Windermere are on the shoreline or in the lake itself (bays, islands, etc). There are some of these in/around Coniston too, but there’s a much wider spread of locations on land around the lake, ranging up to the tops of the Coniston Fells. Part of the key to this lies in the few red dots. The two slightly larger ones are Low Ludderburn, east of Windermere, and The Heald, part-way up Coniston Water. Ransome lived at Low Ludderburn from 1925–35. This period saw the writing of Swallows and Amazons, Swallowdale, Winter Holiday, and the start of Pigeon Post. The Heald was home from 1941–1945 and The Picts and the Martyrs was published in 1943. 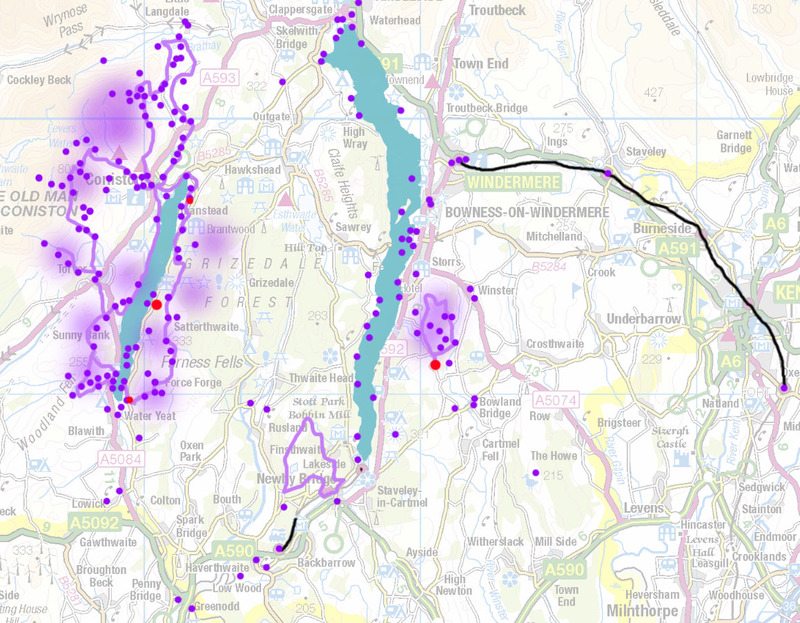 The smaller red dots are Nibthwaite, at the foot of Coniston, and Lanehead, near the head of the lake. Nibthwaite was the base for many idyllic holidays in Ransome’s boyhood and Lanehead, home of the Collingwoods, was central to many visits as a young man. For more on the background see Chapter 7 of Exploring Arthur Ransome’s Lake District. Let’s just return quickly to those outliers that I mentioned. U is Ulverston – only mentioned because Arthur’s family would change trains here on the way to those holidays at Nibthwaite. C is Cartmel, where Ransome stayed as a young man, and at least once walked up to Lanehead and back. A is Arnside, beside the Kent Estuary, which opens into Morecambe Bay. At least one of Ransome’s own boats, Coch-y-Bonddhu (the model for the D’s Scarab) was built here. M is Miterdale, touted by some as the original for Swallowdale, though I don’t buy this at all (see Exploring Arthur Ransome’s Lake District, Chapter 3). B is Burnmoor Tarn, just above. F is Fairfield. The Fairfield Horseshoe is surely the original for the ‘ring of great hills around the head of the lake’. Ransome mentions this, with slight variations, several times. W is Derwent Water and D is Friar’s Crag. Friar’s Crag has been suggested as the model for the Peak of Darien, where Swallows and Amazons opens, and both lake and crag were used for some scenes in the 1974 film. However, I’m pretty sceptical about their real significance and I’ll return to this before long. ‘A ring of great hills around the head of the lake’: the Fairfield Horseshoe from a boat on Windermere.